Gotham’s doing that thing where it Gothams all over itself. Deadline reports Rebel Wilson has joined the cast of Cats as Jennyanydots, an “old Gumbie cat” known to sleep during the day, but teach mice and cockroaches how to knit at night. Mary Elizabeth Winstead confirmed the Birds of Prey movie begins filming this January during a recent interview with Bionic Buzz. It’s sort of a spinoff of Suicide Squad. It kind of follows Harley Quinn, which is Margot Robbie’s character from those films, and this sort of girl gang that she puts together. I play Huntress, and we’ve got Black Canary, played by Jurnee Smollett-Bell, and Rosie Perez and Ewan McGregor. It’s a really fun, fun cast. We haven’t started shooting yet, but we start shooting in January, and I can’t wait. The Joker terrorizes a grocery store before being run over by a taxi in the latest set photos from Just Jared. Meanwhile, four new set photos from Antlers include an illustration of fire-belching apes and Keri Russell scowling in the dark. X-Men Movies has the latest image of Sophie Turner as Jean Grey. Laura Vandervoort shared a new still of her character, Rose, from the Soska Sisters’ remake of David Croenenberg’s Rabid. Vanellope von Schweetz meets the criteria to be a Disney Princess in the latest clip from Ralph Breaks the Internet. Alice Eve learns she’s the imperfect genetic clone of Keanu Reeve’s first wife in the second trailer for Replicas. Chloe the cat gets shredded on catnip in the latest trailer for Illumination’s sequel to The Secret Life of Pets. 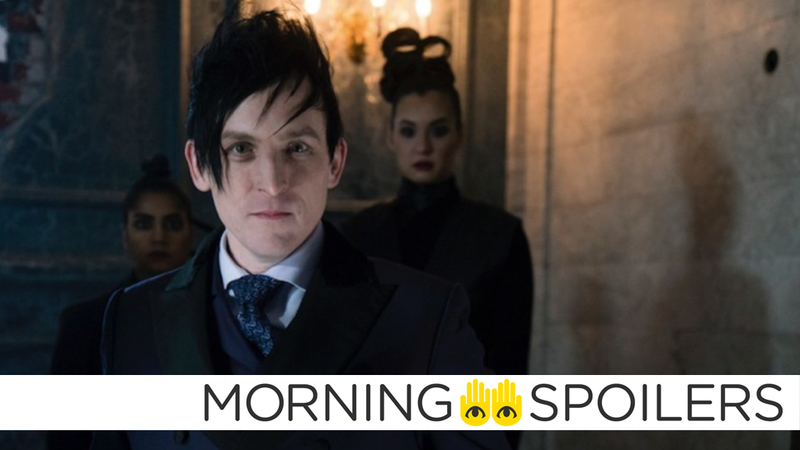 Truly incredible set photos from the series finale of Gotham see the Penguin and Riddler chewing scenery together in their final supervillain costumes. KSiteTV has photos from all three episodes of the Elseworlds crossover. More at the link. KSiteTV also has photos from the November 29 episode of Supernatural, “Unhuman Nature.” Click through for more.